Every year, the demands for multifunctional printers keep on increasing due to the simplicity and affordability it offers. Thus, Epson released Epson XP-420. This machine is able to print, scan, and copy documents without too much hassles. It comes with a 2.5 inch touchscreen as its control panel to help the users operate the device easily. With its Epson Micro Piezo, this machine is able to create ink droplets as tiny 3 Pl, ensuring the sharpness of the results. It is also supported with a good maximum printing resolution, with 5760 x 1440 dpi. Epson XP-420 has an efficient power consumption, with 0.3 watts during standby mode and 13 watts during operation. It uses 4 individual ink tanks, allowing the users to change only the ink that runs out and save more money on printing cost. The speeds are pretty decent, with 4.5 pages per minute for color printing and 9 pages per minute for mono printing. 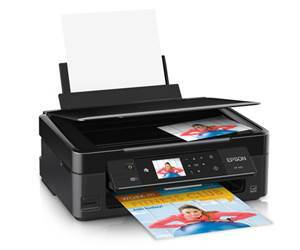 Some of the supported media types by Epson XP-420 are plain photo, photo paper, matte paper, iron-on transfers, and glossy photo paper. This printer is compatible with some operating systems, including Windows (XP and later) and Mac OS X (version 10.6.8 and above).